We got an email from a reader, once, telling us she had eaten many fabulous meals whilst staying in Turkey. Well, we get lots of emails like that, actually. But this particular reader told us she had particularly enjoyed the Turkish musakka – and she wanted to know if we had a Turkish Musakka recipe so that she could make it herself at home. We regularly order Turkish musakka from the steaming bain maries of traditional lokantas like Seçkin Restaurant and Yeşil Asma Yaprağı in Dispanser, Fethiye. It’s classic lokanta food. And so, when we first moved here, we’d never thought of making it at home before. This email request changed all that. And thanks to this, we had a bash. It was a big success and it’s now a regular dish on our table. The advantage of attempting to make something you have enjoyed in the past is that you have an idea of what it should look and taste like. I skimmed the internet and scanned various musakka recipes from Turkey to get the general gist, added more of and deducted more of what we like and don’t like and then cooked it until it resembled what we have seen in the lokantas of Fethiye. After a bit of discussion, and a few years of playing around with different methods, here’s how we now cook Turkish musakka. It serves four people. Where would we be without the aubergine, eh? Such an integral part of Turkish cuisine. From vegetarian meze dishes like the summery aubergine salad to more comforting wintery dishes like the Ottoman dish, hünkar beğendi. 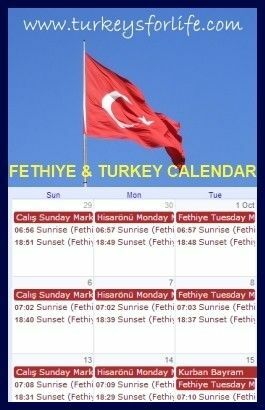 Turkish musakka is neither winter nor summer. It works year round and, depending on how you serve it, you can make it summery or cosy warm for winter. Traditionally, to make Turkish musakka, you’re supposed to begin by frying your sliced aubergines in batches. As well as being time consuming, these days, whenever we’re supposed to fry sliced aubergines for a dish, we lay them on an oven tray and give them a light drizzle of olive oil before baking for 10-15 minutes. Not only is this much easier, it’s also much lighter. Aubergines are oil sponges, and, when you fry them, you’ll find you might need to add more oil to the pan at intervals. You’ll then need to lay them on kitchen paper to soak up excess oil afterwards. None of that needed with the baking method. Whilst our aubergines are baking, it’s also easier to get on with preparing the rest of the Turkish musakka recipe. This is an easy and standard mince meat in tomato mixture: chopped onions, green peppers, garlic, tomatoes and spices. Our spices vary but always include kekik (thyme and oregano mix) and sweet paprika for a rich redness. In winter, for that extra bit of ‘comfort,’ we also add a tiny amount of cinnamon. Obviously, a good pinch of salt and ground black pepper goes in there, too. We like to get two meals out of our Turkish musakka so we oven bake it in two separate oven dishes. Again, this is where we have come to differ slightly over the years to the traditional way of making Turkish musakka. The meat mixture and your aubergines are usually cooked in a shallow pan on the hob with a cup of hot water poured over the top. We lay our aubergine slices in our oven dishes and divide the meat mixture between the two bowls. Once cool, one of them goes in the fridge for the following day. The other is placed to one side until we’re ready to eat. When we’re ready to eat, the oven is preheated to 200 degrees Celsius. We pour a cup of boiling water over our musakka (this loosens the sauce) and then we bake in the oven until it’s fully heated through and the sauce is bubbling. We’re sure you’ll agree, served sprinkled with freshly chopped parsley, it looks so very tempting. This Turkish musakka recipe is light and healthy and fits the bill in both summer and winter. Preheat your oven to 220 degrees celsius. Remove the stalks from your aubergines and slice lengthways - around 1cm thick. Lay your aubergine slices onto an oven tray and lightly drizzle with olive oil. Bake in the oven for approx 15 minutes until the aubergines are softening and have taken on colour. Remove from the oven and allow to cool. Meanwhile, heat a dash of oilive oil over a medium heat in a frying pan. Add your onion and peppers and saute gently until the onions start to sweat. Now add your meat and garlic and stir in. Saute until your meat browns and starts to release its juices. Now you can add your kekik and paprika and mix. Add your chopped tomatoes, stir and cook for 5 minutes until your tomatoes start to soften. Pour in around 50ml warm water and add your salça and mix. Simmer for 5 minutes, do a taste test and season to taste with salt and pepper. Add more water if you want a thinner sauce and simmer for 15-20 mins until you have a rich tomato sauce. Now return to your aubergines. Remove from your baking tray and cut each length into about 4 pieces. Now take an oven proof dish and lay your aubergines over the base. Pour the meat mixture over the top along with a cup of hot water. Place in the centre of your oven at around 200 degrees celsius. Cook for 20 minutes until youır sauce is bubbling. Remove from the oven and leave to stand to cool a little before garnishing with fresh chopped parsley. Serve on its own or with a side of rice or mashed potato. As with all our recipes, calories per serving is an approx guide. 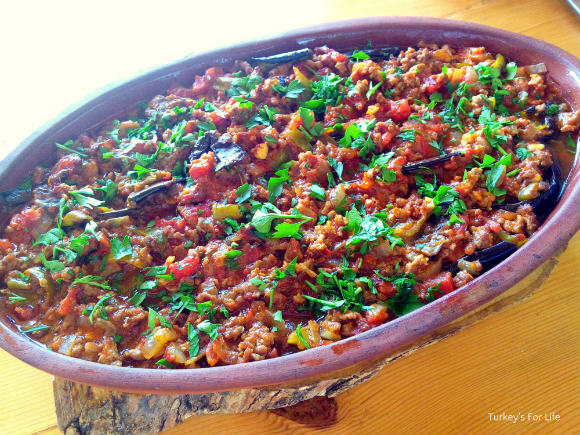 For our Turkish musakka recipe, we use minced beef from our local butcher and this contains fat. If you buy lean minced beef, the calorie count will be much lower. If you're in Turkey and using the long thin green peppers (sivri biber), we use three of these rather than one large capsicum. We have said our Turkish musakka is 4 servings. If you are serving it with other side dishes, it will easily serve 6 to 8 people. We divide our musakka between two oven dishes so that we can eat some the following day. And that’s how we make Turkish musakka. As we said above, we get four servings out of this recipe because we eat it just as it is – 2 servings from each oven dish. If you’re serving your musakka with other accompaniments, however, you can easily use this recipe for a dinner party and serve it to around eight people. In Turkey, unlike the UK, meals like this don’t get served all on one plate. Serve your musakka up on a plate or in a bowl. In a seprate bowl, Turks will often have a portion of rice pilaf or bulgur pilaf. There might be other seasonal dishes such as okra in olive oil or fresh green beans in olive oil and tomato sauce. There’s certain to be a yoghurt dish such as refreshing cacık, and, of course, there’ll be oodles of fresh Turkish bread to be torn and dipped! However you choose to serve your Turkish musakka, we’re sure you’ll love it as much as we do! Yum! Musakka is one of my favorites! Thanks for the recipe! Can’t wait to try it at home! Connie and Cardamom Hills – easy to do and we weren’t disappointed with the result! Hope you like it, zablon. Afiyet olsun! 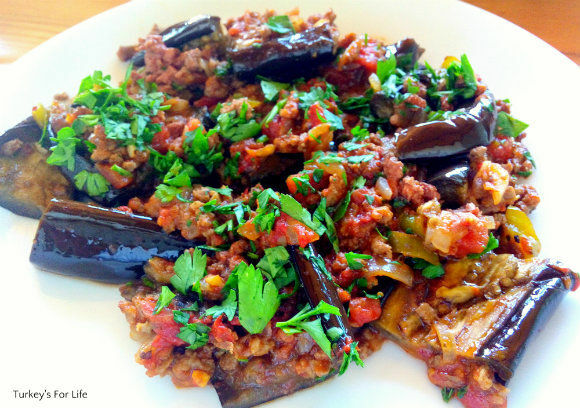 Aubergines and minced meat together in Turkish musakka – perfect combination, April. 🙂 So easy to make, too.